Two college students make the discovery of the century in a modern 40s sci-fi story, Vampire Warlord Padre Juan takes his battle to heaven and hell (first On Becoming a Monster story in “print”), Henry and Rain learn to love each other despite crazy friends, a new video game and the complications of being human. 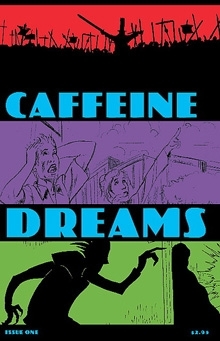 Caffeine Dreams is a B&W anthology of standalone short stories. This title was added to our catalog on January 27, 2010.